The STX 165 Sports a professional 1/2 3ATI Bezel that complements any aircraft panel. Its bright OLED display is readable in virtually all lighting conditions and automatically dims for night time operations. Check out just a few of the STX 165 features. * The STX 165 Panel mounted Size 1/2 3ATI Panel Cut Out Behind Panel, You can actual place this unit in a 3 1/8 instrument hole. 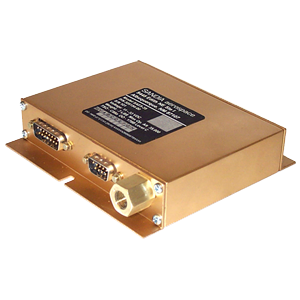 Built-in Encoder – Simplifies installations and lowers cost. Small and Light Weight – 7.4″ behind the panel depth, 1.3 lbs. The chart below shows the current requirements for the STX 165 and STX 16R with both 14 and 28 volt power inputs and squawk codes of 7777 and 1200. The encoder heater is off for these calculations. Q: What are the STX 165 and STX 165R power requirements? A: Both the STX 165 and STX 165R (Remote) are designed to operate from 11-33Vdc. Current consumption is dependent on three factors: 1) Squawk Code. The higher the squawk code the more pulses that are transmitted. More pulses require more current. 2) PRF (Pulse Repetition Rate). Like the squawk code, the higher the PRF rate the more current a transponder will draw. 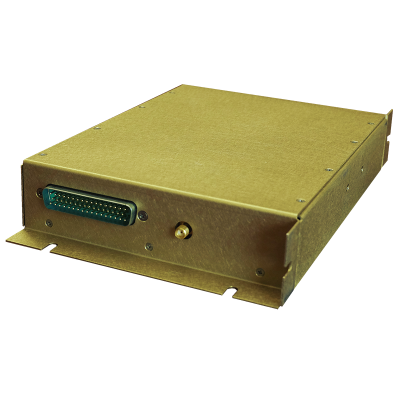 3) In the case of the STX 165 that has a built-in encoder current increase when the encoder heater is on. Q: What is the Strobe Line? A: Older transponders"Strobed" encoders whenever they wanted an altitude update. This is not required in newer transponder systems. When the STX 165 altitude output is being used by another system that does not require a strobe, a ground on the STX 165 Strobe line is usually required. Q: What does 1/2 3ATI cut out mean? A: A 3ATI is a 3" Airline Transport Indicator size cut out. 1/2 is exactly that. It is the 3ATI form factor but only half height. Sandia uses this form factor because it is both an industry standard and has a professional appearance. A: Yes, there is a connector kit supplied with the unit. Q: Do you have a Free loaner punch for this product? A: Yes we have a Free loaner STX165 punch. You are responsible for the shipping cost. Typically it is around $60 round trip. We take a deposit for Panel punch and release funds after we receive the punch at the factory. Q: What is the SMA Connector? A: The SMA connector is a standard aviation industry connector. 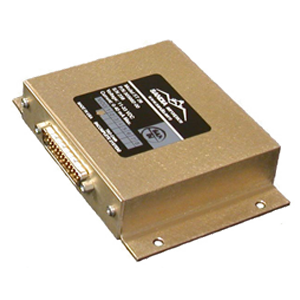 If you do not have a SMA crimper it is suggested that you contact a local avionics shop. Stein Air (www.steinair.com) fabricates harness to your custom length. You can also use an SMA to BNC adapter but you might experience some dB drop in signal. Q: Is it ok for me the turn the power on without being hooked up to an antenna? A: The transmitter could become damaged. Please do not power up the unit until you are connected to an antenna. Q: Why is the snowflake always flashing? A: It is preset at factory to be on. It reminds you there is a optional OAT probe that will display temperature (Sandia STP 78 part number 305561-91). If you need to turn off the snow flake please refer to section 3.9 in the installation manual (Installation Configuration). Q: What is the Panels screw size? A: 4 each 6-32 pan head screws . Q: Is this unit ADS-B compatible? 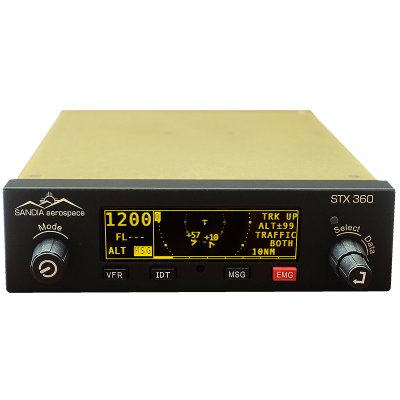 A: Sandia STX165 Mode C TRANSPONDER with a UAT / WAAS GPS will meet the 2020 ADS-B mandate when interface with a compatible UAT transceiver. 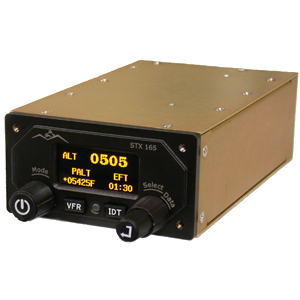 The STX currently interface with the L3 and NAVWORX to provide an affordable ADS-B compliant solution. When installing ADS-B the FAA recommends against installing both 1090 ES (Mode S) and UAT as they can conflict with each other and transmit your aircraft position twice. Q: Can I reduce my power consumption? A: Yes. You can do so by reducing the MAX RATE of REPLY. This is field select option.